What the Heck is Dragon Age Origins: Darkspawn Chronicles? 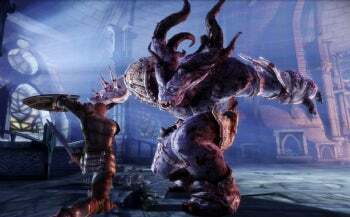 The grapevine says there may be a new Dragon Age Origins expansion in your future, and the sub-name's tantalizing: Darkspawn Chronicles. Sounds kind of ominous, doesn't it? Like The Chronicles of Narnia. Or Prydain. Or The Spiderwick Chronicles. Or, you know, just Chronicles (the album, by Steve Winwood). No one knows what it is, or where it's coming from design-wise, or why it exists at all, but according to Microsoft's Xbox 360 press blog, it'll be available on May 18 for 400 MS Points, or $5. Before you get too excited, recall that Dragon Age Origins: Awakening--the last major expansion for the game--costs $40 in the store (equivalent to 3200 MS Points). Do the math and Darkspawn Chronicles sounds like a costume update, or maybe a couple new weapons, not a "an extended account in prose or verse of historical events, sometimes including legendary material, presented in chronological order and without authorial interpretation or comment" of the game's notorious flesh-rending bad guys. The game description isn't exactly illuminating, reading simply "This Add-on...extends the life of Dragon Age: Origins, the dark fantasy epic that has you playing as a Grey Warden, one of the last of a legendary order of guardians." "With the return of mankind's ancient foe and the kingdom engulfed in civil war, you have been chosen by fate to unite the shattered lands and slay the archdemon once and for all." And I say again, sounds a trifle portentous, no? But $5...let's just hope it's not another Pinnacle Station affair, which Mass Effect lead Casey Hudson once described as "a kind of casino gaming fight club space station," and everyone else summed up in a word: Unnecessary.